Mahogany is a kind of wood-the straight-grained, reddish-brown timber of a tropical hardwood we only source sustainable and environmentally responsible Mahogany. Mahogany has a straight, fine, even grain and is relatively free of voids and pockets. Its reddish-brown color darkens over time, and displays a reddish sheen when polished. It has excellent workability, and is very durable. Historically, the tree's girth allowed for wide boards from traditional mahogany species. 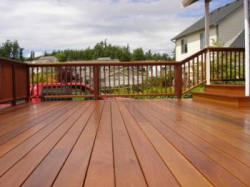 These properties make it a favorable wood for decking, cabinets and furniture. Mahogany is a dense hardwood grown in naturally sustainable forests. Ideal for high traffic environments.